Originally posted at Climate Central. View the original post here. In New York and many other cities across the U.S., you’re likely to have access to a program that will allow your home to be powered with wind energy through your local utility, reducing your home’s reliance on climate-changing fossil fuels for electricity. But where are the wind farms that produce that energy? Two new online interactive maps produced by the federal government show where the nation’s wind farms are, how quickly they were built and what impact they may have on the landscape. Wind energy is expected to make up about 4.6 percent of total U.S. electric power generation by 2015, totaling about 77,000 megawatts of wind power capacity nationwide, U.S. Energy Information Administration data show. That’s up from 3 percent in 2012, when total U.S. wind power generation capacity was about 60,000 megawatts. One megawatt of wind power is enough energy to provide electricity to roughly 300 homes. A new interactive map featured on the U.S. Department of Energy’s website shows how fast all those wind farms were constructed. The first panel in the map shows the nation’s first wind farm going online in southern California in 1975, producing enough electricity to power 4,149 homes. Flash forward 20 years to 1995, and there were 54 wind farms across the country, mostly in California, powering 349,000 homes. By 1999, wind farms were coming online throughout west Texas, Minnesota, Wisconsin, Iowa, Colorado and Wyoming. As of 2012, there were more than 45,000 wind turbines in 39 states and Puerto Rico, providing enough electricity to power about 15 million homes. Though all those turbines help reduce greenhouse gas emissions from coal and natural gas power plants, wind farms can still be harmful to some animals, from habitat fragmentation to birds colliding with turbine blades. To help scientists study those effects, the U.S. Geological Survey announced in February that it has launched a new online mapping tool, called theWindFarm Mapping Application, which will help the agency assess the environmental impacts of wind farms on a national scale. Geographic data for the maps were released at the same time. 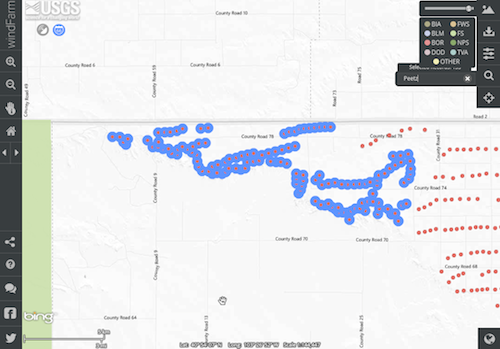 Though some features of the maps are a little glitchy, the mapping application allows users to zoom in on a specific wind farm and see how its turbines are distributed across the landscape. Turbines shown on the map are also color-coded for their wind-generating capacity, and the accompanying dataset provides information about each turbine’s height, manufacturer, model, capacity and turbine blade area. In its announcement of the application’s release, the USGS said the data is available to the public to help scientists, nonprofit organizations, the energy industry and land managers study wildlife collisions, how turbines overlap major migratory flyways and how wind farms affect the surrounding environment.